From Cesare Ripa's Iconologia (first published in 1593, not illustrated). The previous page displays the text. That's a wonderful image. I love the hobby horse, which still has associations in England; but especially the pinwheel, which makes me think of the Mitelli from the mid-1600s. You'll notice the same image in the forum banner. The text from the previous page is interesting too - imagine every 's' written in the old way, like a long 'f'. A person at Man's Estate, in a long black garment; laughing; riding upon a Hobby-horse; holding, in one Hand, a Whirligig of Past-board; and plays the Fool with Children, who make him twirl it by the Wind. Folly is only acting contrary to true Decorum, and the common Custom of Men, delighting in childish Toys, and things of little Moment. The Mitelli Fool is rather beautiful, with only concentration and delight in his expression. 1 print (etching), 36.8 x 26 cm. The soldier picture expresses a bad mood in a bad time - 30-years war in Germany, in 1632 14 years have passed and 16 are still to come. After it the population had decreased to 2/3 of the original state. Another interesting one from Ripa is Pericolo (i.e. Danger). And this one. I wonder which deck was the first to show the figure on the edge of a precipice? A Stripling walks in the Fields; treads upon a Snake which bites his Leg; on his right Side there is a Precipice, and a Torrent on the other; he leans only upon a weak Reed; and is surrounded with Lightning from Heaven. His youth shows the Danger he is in. His walking shows that men walking through the flow'ry Fields of Prosperity fall into some Calamity unawares. The Reed shows the Fraility of our Life, in continual Danger: The Lightning that we are subject, besides, to Danger from Heaven. 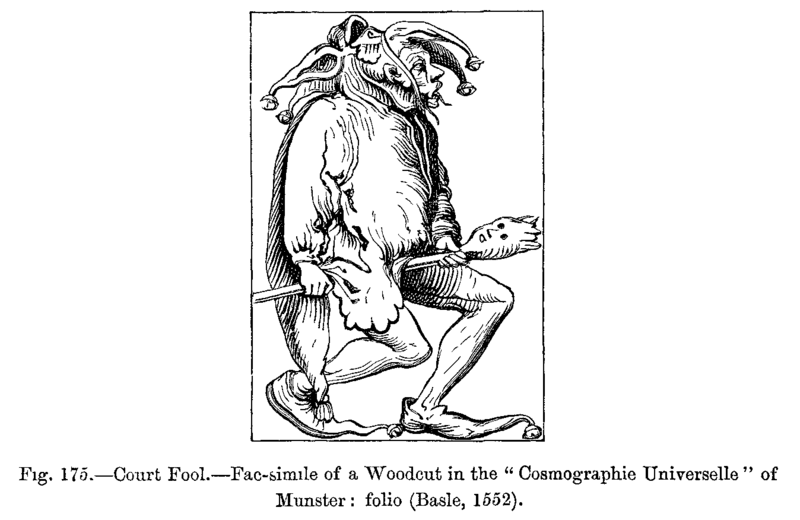 There's some interesting text about jugglers and fools, also card games, but no mention of tarot. Hmmmm. .png seems to work for me. I think we have to be careful that the tags don't have any spaces or returns after the URL. I'm guessing that might have been the problem?? But, yeah, I checked the settings and .png is supposedly allowed. Thanks again Pen for all the time you have been putting into these threads, they're wonderful, and your contribution is much appreciated.